Just because your air hockey table is like one out of an arcade, doesn’t mean that your game should sound like it. These quiet white air hockey pucks provide a commercial quality feel with a quieter result. 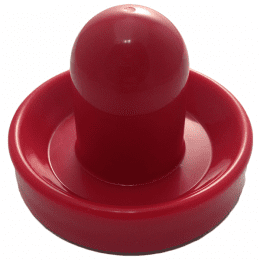 The 3-1/4″ Dynamo puck is a white puck used on Coin and Pro Style Hockey tables. The special rubberized coating that is used on these pucks provides for a quieter game and a softer feeling strike. Dynamo pucks are a heavier weight than competing pucks to promote greater stability and keep them on the table. These pucks weigh approximately 1.22oz, are 83 mm diameter, and 7mm thick. You can purchase this puck in a pack of one, two, or five. Available in two sizes: 2-½ inches and 3-¼ inches. 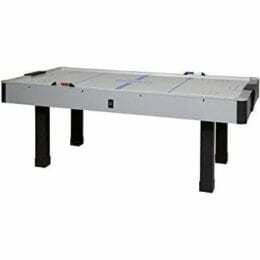 Just because your air hockey table is like one out of an arcade, doesn’t mean that your game should sound like it. This Large Dynamo Quiet White Air Hockey Puck provides a commercial quality feel with a quieter result.